I am always experimenting with new gluten-free recipes that the entire family can enjoy. I like making sweets and enjoy it even more if the sweets are made without processed ingredients and include minimally refined ingredients, which fits this recipe. These gluten-free almond joy oatmeal cookies are delicious, soft, chewy, and loaded with texture. You know you want some! The inspiration for this cookie came from one of my favorite candy bars, the Almond Joy. Maybe I could make a Caramello cookie one day?!? These cookies are full of yumminess. Delicious almond and coconut flours with oats, coconut, and chocolate mixed in. How could you possibly resist?? I know that I can’t. 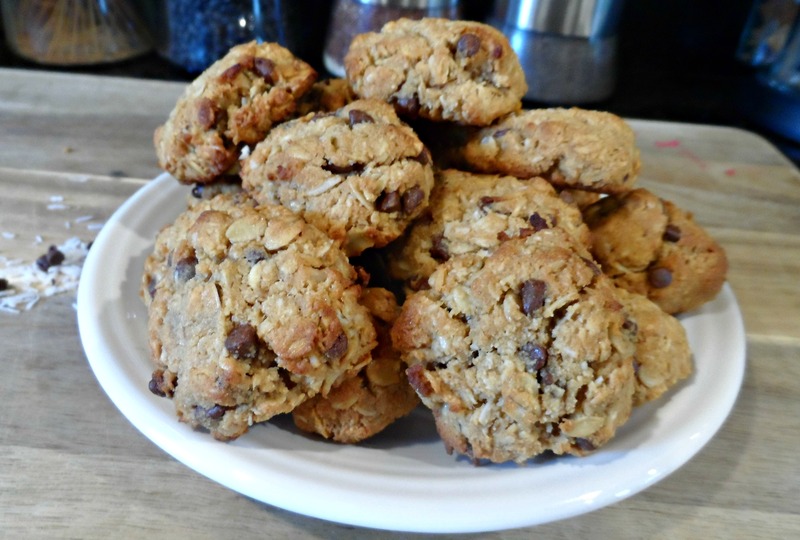 I could eat a big ‘ol plate of these gluten-free almond joy oatmeal cookies! You can skip to the bottom to see step-by-step instructions and a printable recipe. I skipped white or brown sugar when making these cookies and used coconut palm sugar instead. Coconut palm sugar is made from sap that is extracted from the coconut tree. 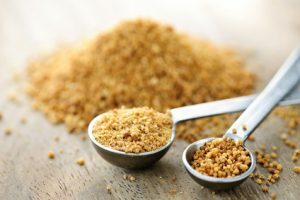 Coconut palm sugar is not a super-food but it does offer some trace nutrients, vitamins, and minerals. It may also have less of a dramatic impact on your blood sugar than other types of sweeteners. The taste of coconut palm sugar is similar to brown sugar, you can use brown sugar in this recipe if you do not have coconut palm sugar. I use almond and coconut flours in this recipe, they are a great combination. My youngest daughter cannot eat gluten so we use many alternative flours in our kitchen. Almond flour is gluten-free, low in carbohydrates, high in fiber and a high source of protein. 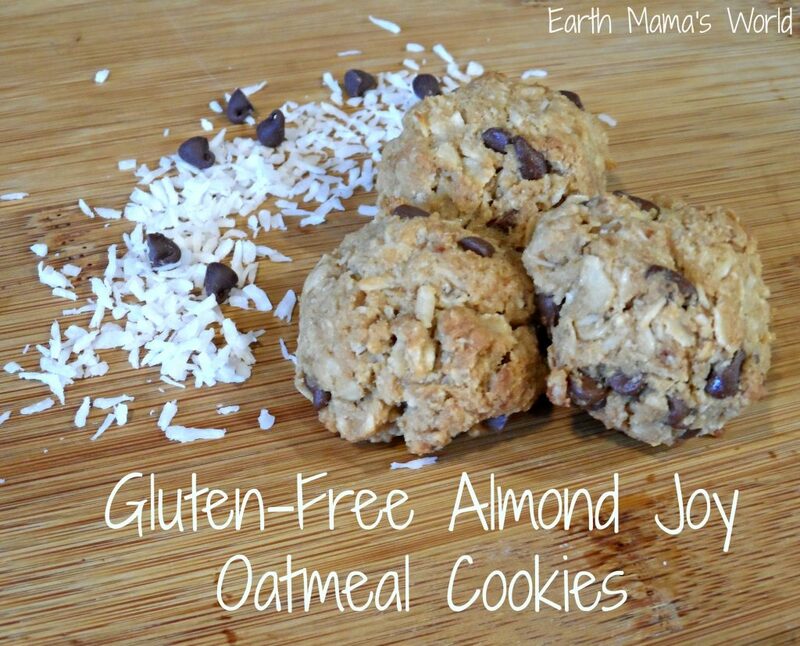 Coconut flour is also packed with protein and it compliments the flavor in these gluten-free almond joy oatmeal cookies! I think that even if I didn’t need to make gluten-free foods I would still use almond and coconut flour instead of wheat flour. Okay, so enough about the ingredients let’s make these darn cookies! First you mix all of your dry ingredients in a large bowl. Into the bowl goes the old-fashioned oats, almond flour, coconut flour, unsweetened shredded coconut, baking powder, and salt. 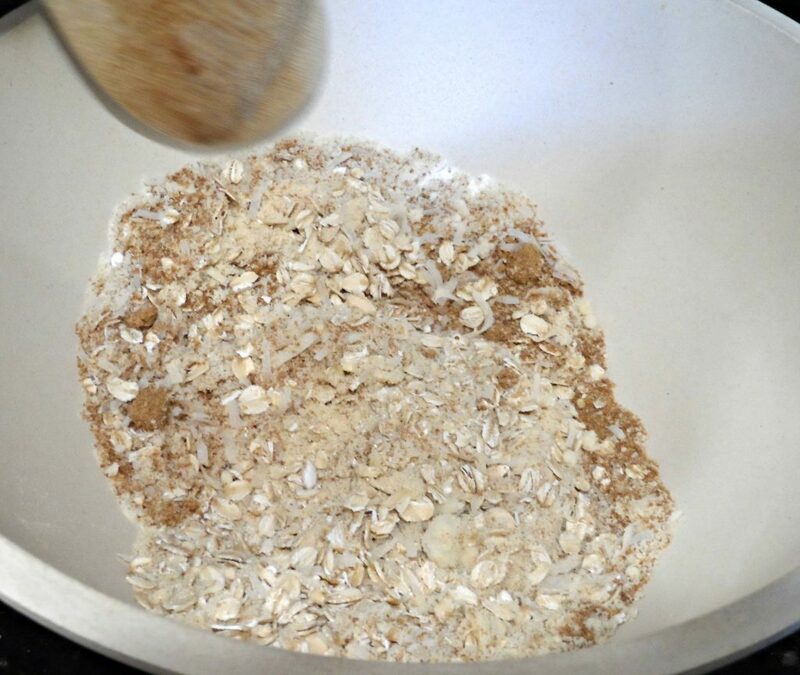 In a smaller bowl mix together your wet ingredients. Into this bowl goes the egg, softened coconut oil, honey, and vanilla. 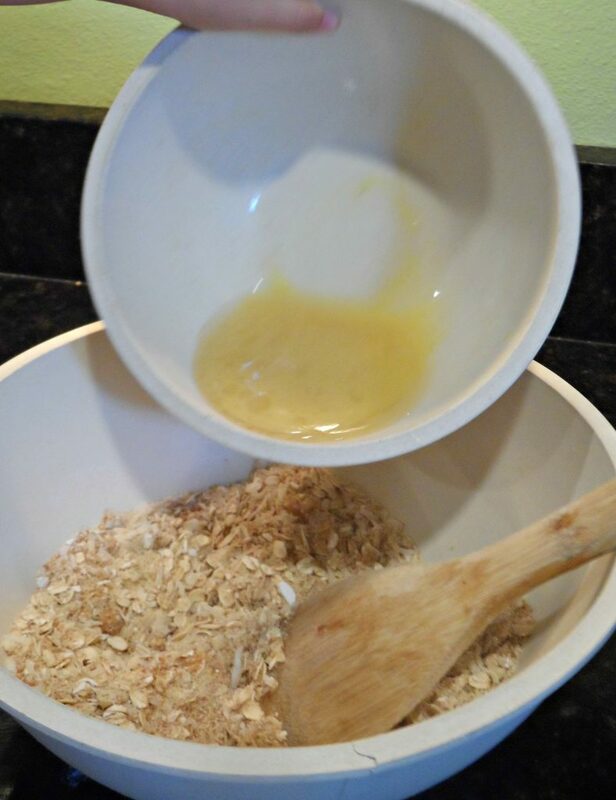 Then you will pour your wet ingredients into your bigger bowl holding your dry ingredients. 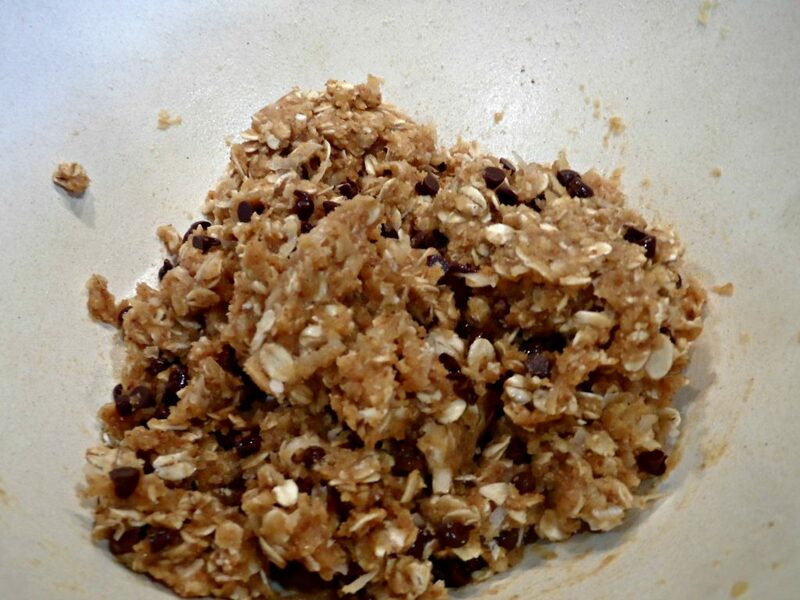 Mix it up until it is all moist with no dry bits then fold in the chocolate chips. The next step is letting the batter rest in the fridge for about half an hour. You can totally skip this step if you are in a hurry or simply need cookies FAST! 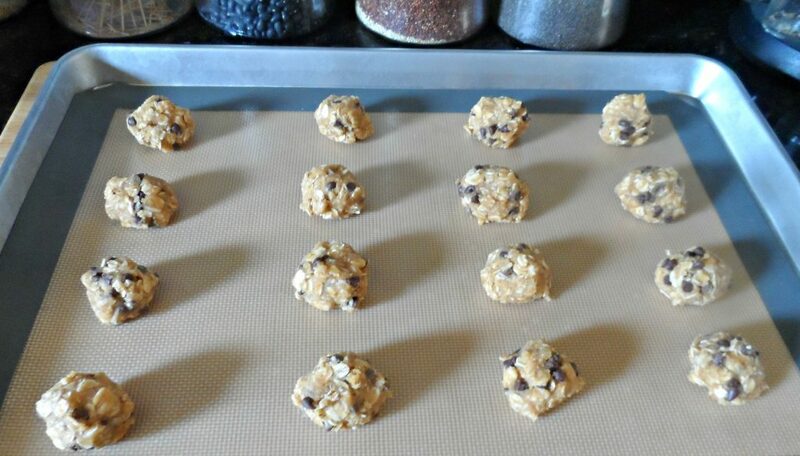 Spoon or roll the dough into balls and place on a greased cookie sheet, parchment paper, or a non-stick mat. I have been loving the non-stick mats that my mother-in-law gifted me! Space the cookies several inches apart. Bake in a pre-heated over at 350 degrees for 8-10 minutes. Remove from oven and let cool for about 5 minutes prior to placing on a cooling rack. 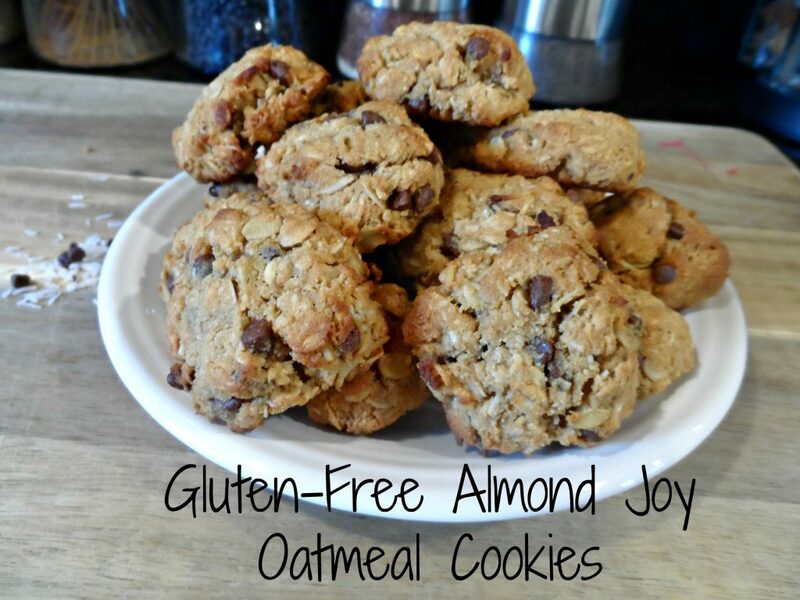 Gluten-free almond joy oatmeal cookies are the best chocolate oatmeal cookies you’ll ever make, and they don’t taste healthy at all! In a large mixing bowl combine oats, almond flour, coconut flour, shredded coconut, baking powder, salt, and palm sugar. In a smaller bowl whisk together egg, coconut oil, vanilla extract, and honey. Place the mix in the fridge for about 30 minutes. 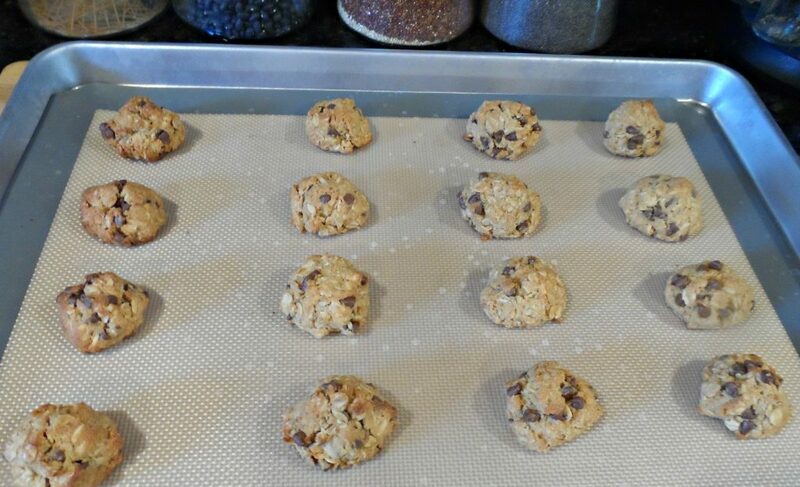 Use a tablespoon to drop cookies onto a baking sheet with parchment paper or non-stick mat, you can flatten them a bit if you would like. Bake for 8-10 minutes in a preheated oven at 350 degrees. Remove from oven and allow to cool for about 5 minutes before transferring to a cooling rack. I hope that you love these cookies as much as me. If you have a delicious gluten-free recipe I would love it if you share it in the comments. 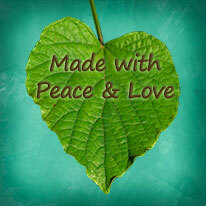 To see all of my gluten-free recipes click here. To see all of my real-food recipes click here. This post is part of the What’s Cooking Wednesday link party over at Buns In My Oven. These look simply amazing! I’ve heard lots of good things about almond and coconut flour and have seen it at Sam’s Club while walking around. Never even thought about buying it, but my friend just made pancakes with coconut flour and said it’s so good! I hope you like them and I hope that you feel better after going gluten-free!